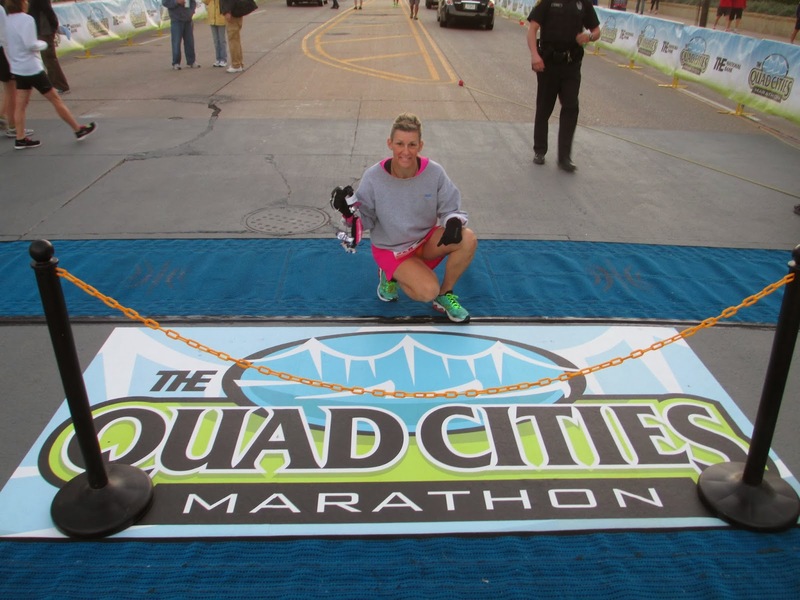 The Quad Cities Marathon. Oh how I LOVE this event! There is SO much to say about this event. 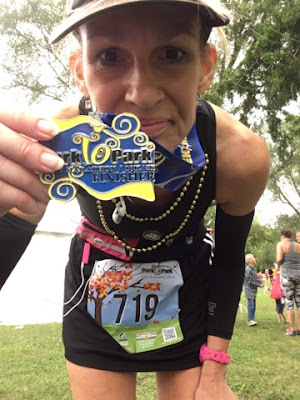 Since I've already said much of it in previous recaps (2013 Full Marathon and 2015 Marathon Relay), I'll just go with some details from this past weekend, and share a few runfessions for good measure. Currently, I'm training for The Route 66 Marathon, and that is my main focus. That said, I still wanted to make a decent showing at the QC. 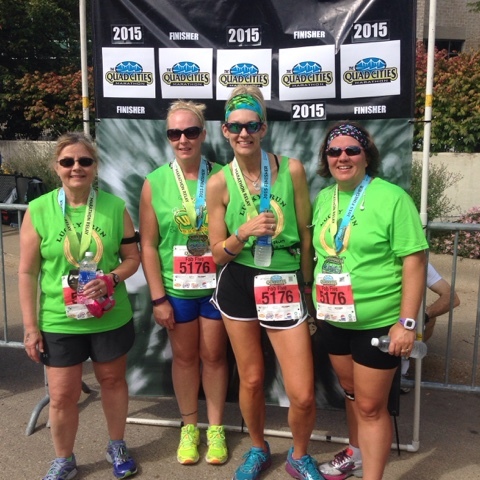 I was not only registered for the half marathon, but I was also part of a marathon relay team. 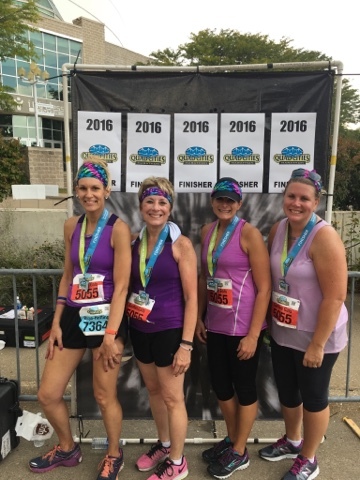 My goal, first and foremost, was to rally my team (comprised of myself and three cousins) to have a great marathon experience. My second goal was to run the half marathon strong, ideally with a negative split, and (if all the stars, moons and planets aligned)....nail a sub-2 finish or, better yet, a new PR. 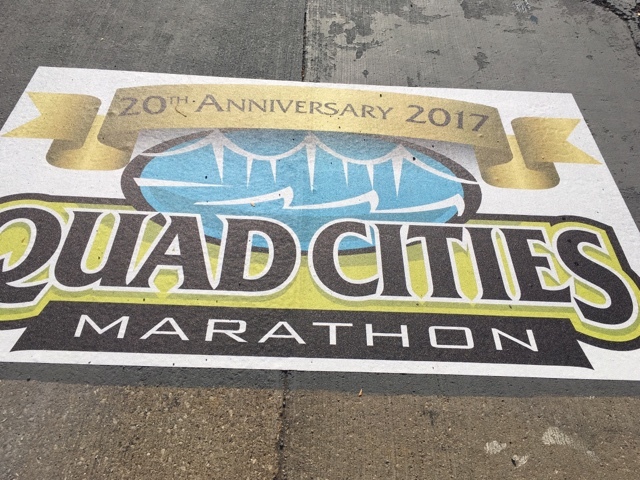 This was the 19th Quad Cities Marathon, and the latest stats showed more than 5,100 runners/walkers participated. The event offers a 1-mile walk, 5K, half marathon, full marathon, and a marathon relay. Leading up to the the big day (Sunday, September 25th), the weather forecast looked less-than-desirable. It showed rain and possible storms in the morning (WHAT????). As race day drew nearer, it looked better, but still not dry (the storms kept getting pushed to later). Finally, Saturday evening, it showed a cloudy forecast and possible rain/storms happening after 1:00PM. WHEW. Of course, with the rain getting pushed back, the air would still be humid. I can handle a little bit of humidity, so I was not concerned. I was just glad we wouldn't have to deal with rain, especially during the downtime before/after we had run our legs of the course. I rode to the race site with Rhonda and her husband, Tim. We met up with the other gals, Jessica and Kelly, almost immediately after arriving. As mentioned, I ran the full marathon in 2013. Jessica ran it a couple years prior as well. 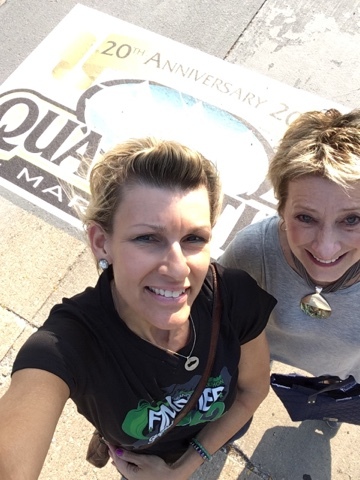 This was Kelly's and Rhonda's first marathon experience, so they were a bit apprehensive as to how the day would play out (dealing with shuttle buses to/from the relay exchange points and getting to their respective exchange points on time). Since I was also running the half marathon, I had to be the first runner...which meant lining up at the start line, just like I'd done on that day back in 2013 when I ran this marathon for the fist time. I'm an emotional gal, and I was almost shaking with excitement as I waited for the gun to go off and get the party started. The race began. The first half mile or so leads us on a straight-away before we merge onto a ramp that takes us to the first bridge across the Mississippi River, en route from Moline IL to Bettendorf IA. This part of the race is very tight and crowded. The 5K course had already split off, but the rest of us (marathoners and half marathoners) were crammed into one lane of the four-lane bridge. Granted it's a bit uncomfortable, but it does force one to run slow and easy...and that, after all, was my goal for the first several miles. I made it across the bridge, and about halfway into mile 2 is the only major hill of the race. It's not steep, but it's very long and has just enough of a curve that you can't really see when it's gonna end. It wasn't until I was approaching the 4-mile mark that I noticed my GPS watch was flashing "2.59 miles...Save? Resume? Delete?" WHAT????? Thankful that I had an extra watch alongside it (as a backup), I hit the resume button on the GPS watch. So much for knowing my splits. Not a big deal, since I'm used to calculating my approximate pace at the mile marks...but I do like having the stats to reference when I finish a race. So, onward. I was feeling great, though it was difficult to hold back and not just run by feel and enjoy the route. If there's anything more awkward that trying to run faster than what feels comfortable, it's trying to run slower. As I have said many times, I am an average runner at best. I do not pretend to be a fast-paced sprinter, nor do I shun the others who are slower than myself. 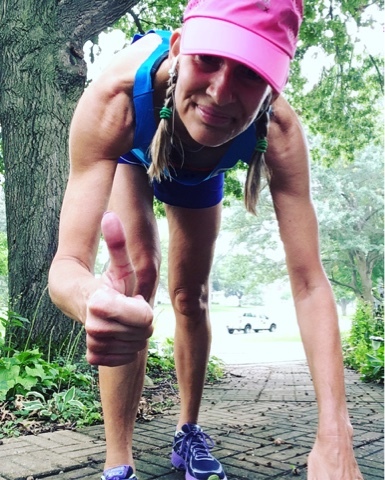 But, with my long legs, big feet, and lengthy strides, I often times struggle with "going slow" (unless I'm already exhausted from starting out too fast). I was holding just under a 10-minute pace without any effort despite the warm temps. By the way, did I mention the clouds were a no-show? I was grateful for the lack of rain, but none of us were expecting to have so much sunshine on such a humid morning. I kept grabbing water at each of the water stations (which were at most of the mile marks). I made it 6.5 miles and spotted Jessica at the relay exchange corral. I handed her the "baton" (which was a slap bracelet). By now, I had been running for about an hour, so my pace was doing well. I spotted a water stand shortly after the exchange, so I gulped down a gel and grabbed some water quickly before we continued on.The half marathon and full marathon share the same route until the 8.5 mile mark, where the half splits off and works its way back towards the finish line. Jessica and I ran those two miles together...and she really helped my up my pace! Before long, we came to the spot where our two routes would split. We wished each other well, and went our separate ways. I grabbed some more water shortly after splitting from the marathon route and walked for a few seconds as I drank. Suddenly, I was feeling a little light-headed. The temps had gotten warmer and I could tell I was a sweaty mess! By now, I had completely given up on my GPS watch (I had tried to "resume" the setting several times...and it still was showing less than 3 miles of distance). My other watch showed about 1:25 of elapsed time around the 9-mile mark. Although I was still feeling energetic, I found myself back in that all-too-familiar place....feeling the sub-2 and PR edging away from me. I had also been trying to ignore the briefest twinges of "something" in my calves. There have been a handful of other races when after walking (which I had not done...yet), my calves would seize up when I'd resume running. Afraid of that happening, I had not let myself walk for more than a few seconds as I sipped the water at the water stations. The cramping continued. I still felt energized, but had to stop several times to stretch and massage the knots in my calves. It had really gotten hot (mid-80's) and it was humid. Thankfully, there was a breeze, but it still was much hotter than any of us had anticipated. Every time I'd start back running, I'd feel great for about a 1/4 mile or so, then the cramping would return. As frustrating as it was, I did my best to keep my thoughts positive. Unfortunately, this part of the course was on Arsenal Island, which is a private military base, meaning there are limited spectators allowed on the course. There was a long stretch(almost an entire mile), a couple turns, then another very long, straight stretch. And, there were a lot of runners who were walking in those final miles. There were several water stands, but not really any crowd support other than the volunteers handing out water, Gatorade, or fruit (near the bridge that exited from the island and lead us to the finish line). Mentally, it really was tough to stay in the game. I was able to run the final mile pretty strong. It actually felt great going across that final bridge because you could see the water through the grates underfoot and feel the breeze blowing through. Mile 13 of the half ends just after exiting the bridge (which is where mile 20 ends for the full marathoners...they then have turn to the left, and run an out-and-back 10K). For the half-marathoners, all that remains is a right turn and a short sprint to the finish line. As I was coming down the exit off the bridge, I immediately spotted my husband...with his phone (camera) ready. My official finish time was 2:14:46.....again, not my greatest 13.1 finish time, but considering the numerous walk breaks and stops for calf massaging in the final miles, I am completely at peace with it. I'm not a wimp in the heat (or humidity), but it was almost more than I could bear (and that's saying a lot LOL). Shortly after finishing, I found the husband in the crowd, as well as Rhonda and Kelly. Rhonda's husband (and both of their sons) were also there! 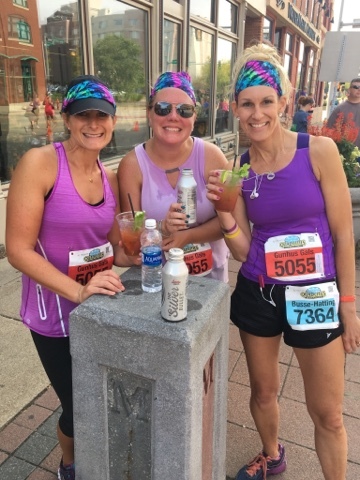 Jessica was actually running the 2nd and 3rd leg of the relay, so that's why Kelly and Rhonda were still hanging around the staging area. We chatted for a bit, then they left to head to their relay exchange points. 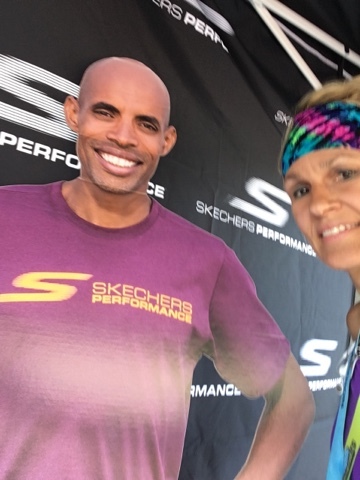 Well, hey there, Meb! What brings you here? 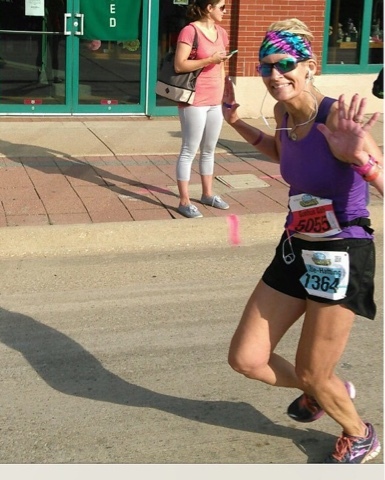 As soon as we spotted Rhonda making her way towards us, we joined her for that final jaunt to the finish line. Words cannot express the emotions we all were feeling in those final steps. Every finish line has a story behind it, and this finish line was no exception. Hands-down, my favorite pic of the day....all of us are smiling as WE finish the marathon, together! It had been a long day, in more ways than one. The early morning (5:15AM wake-up). The hot weather. Unexpected aches and pains. For some of us (Rhonda), it was the longest distance ever run. For others (Jessica), it was a tribute to her mom (and our aunt), who has been undergoing treatment for cancer. Still for others (Kelly), it was reassurance that one can, indeed, go the distance. And, for some of us (myself), it was a monumental race...my 30th half marathon. This was such a great day. I cannot express how proud I am of these gals, and so thankful to call them family. 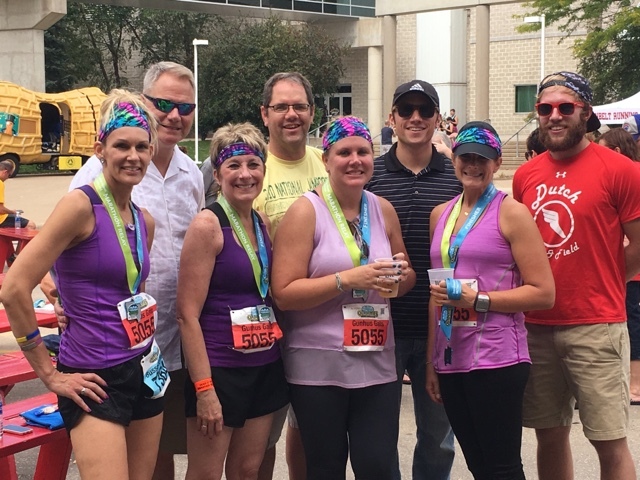 Most marathon relay teams are made up of five members, but we couldn't persuade anyone else to join the craziness....so we made due with "just" the four of us. 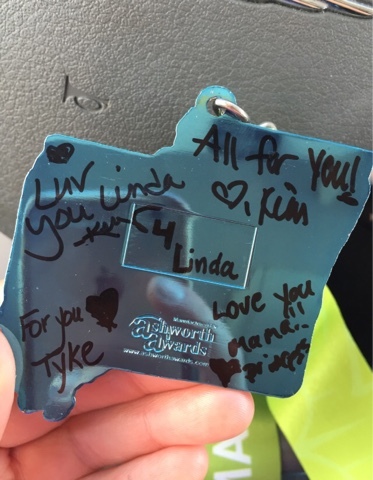 Our Aunt Linda (Jessica's mom) was our honorary fifth member, and we gave her the extra team shirt and medal. We also were very thankful to have a support team there with us. My husband doesn't make it to every race I do,but he does come to the important ones. Rhonda's husband (and their two sons) were so supportive....driving back and forth between relay exchange points and capturing some of the days events on film. 1 - I must runfess... 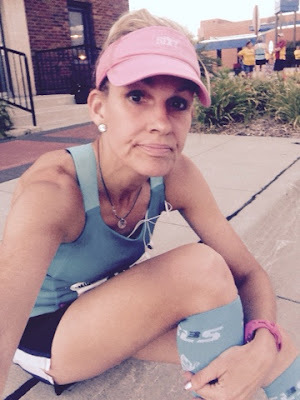 I am proud to be a runner and could care less about the "racing" aspect of races. 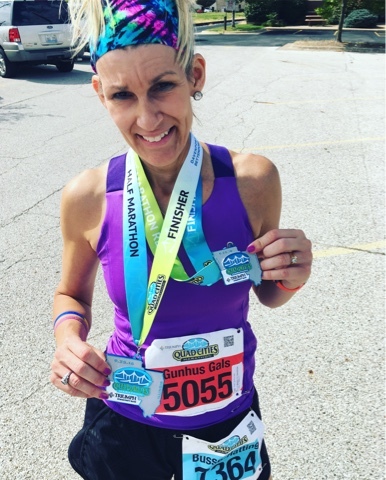 Sure, I'd like to spank a few more PR's and capture some more sub-2 hour 13.1 finishes.....but I have done them all before, and I know I can do them again. 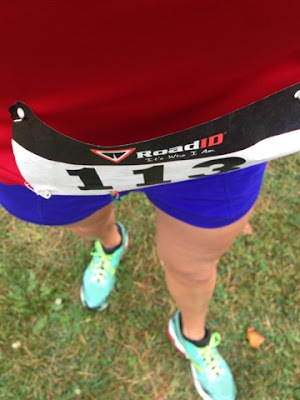 I do not have the "need" to do them every time I pin on a race bib. I flat-out refuse let my finish time determine whether or not I enjoy my experience at any particular event. 2 - I must runfess...I am quite content with my finish time. Granted, it was not a fast finish for me, but I did the absolute best I could do given the circumstances of my situation. 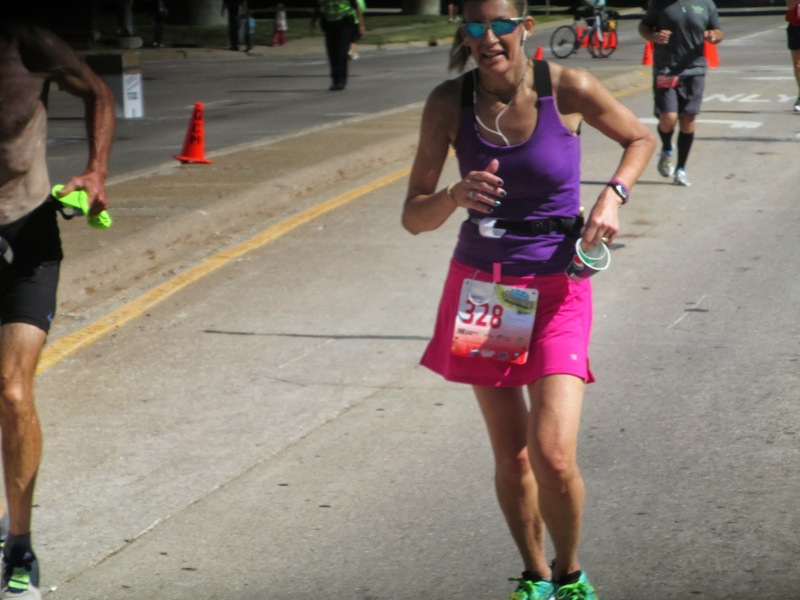 Even though I had to stop repeatedly for "muscle maintenance," I never felt like I was giving up on the race itself. My energy felt great despite the aches and pains I was feeling. Official stats said the "average" finish time for the half was 2:27:06 (the heat got to a lof of people). 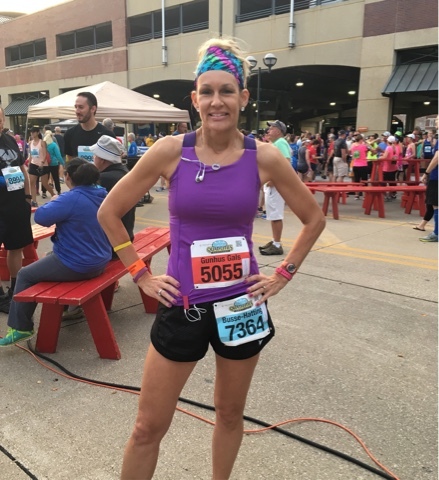 I finished 27th out of 113 gals in my age group; 318th out of all the 1034 females; and 713th out of the total 1765 half marathoners. 3 - I must runfess...I am OK with the GPS watch fail fiasco. I do not run with my GPS watch every time I lace up my running shoes. I am not addicted to the ongoing stats it can show me. And, I do know a thing or two about math, so I can calculate my approximate pace at the mile markers "old school" if I know my elapsed time. It's frustrating not knowing my splits (after I finish), but life goes on. 4 - I must runfess....as much as I love the sun, I was a bit blind-sided by it. I had spent the greater part of the week stressing over the forecasted rain, and was anticipating a miserable morning dodging lightning bolts. I welcomed the beautiful sunshine with open arms...but it did make for a very hot & steamy race. 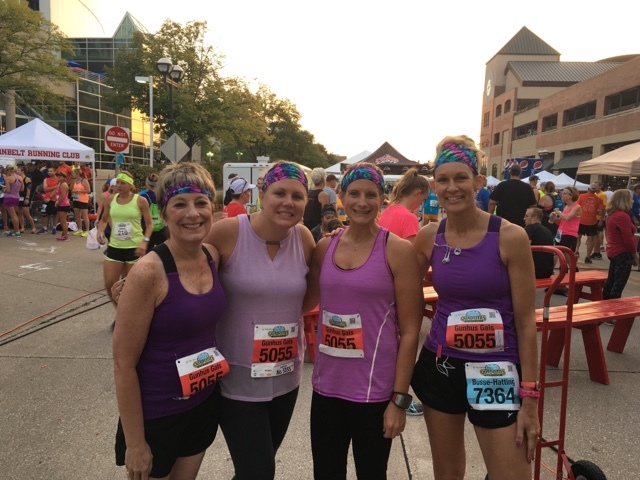 5 - I must runfess....the four of us are already talking about doing another marathon relay, possibly in the Bahamas! 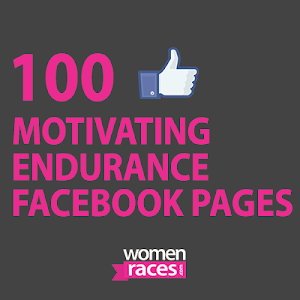 We know we can persevere in the heat, why not do it all over again elsewhere? So there you have it. Another successful adventure in my running shoes, this time with family. Life is good! 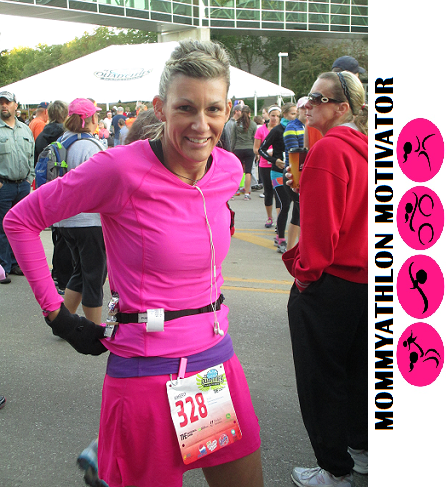 Have you ever done a marathon relay? 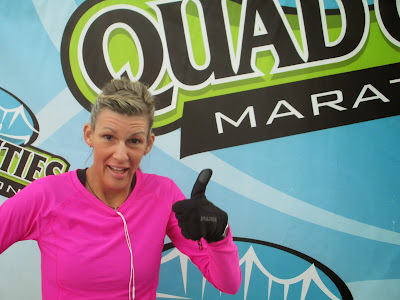 Ever ran the Quad Cities Marathon? Ever experienced cramping calf muscles? 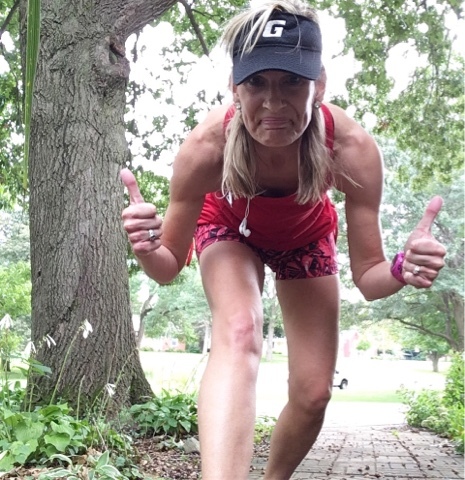 How do you feel about heat and humidity of race day? I'm linking up with Marcia for the Runfessions link-up and also with Mar and Courtney and Cynthia for the Friday Five. I invite you to checkout both of these great link-ups! 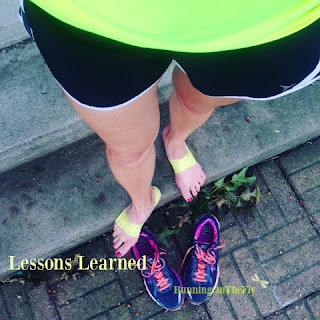 I have seen and done a lot of things in the 11+ years I have called myself a runner. And, not all of it has been wise. There was the time (six months ago) when I was oh-so-close to capping the 100 mile mark with my mileage. My body was not feeling beaten up, but it was more tired than I acknowledged. And, I am NOT a high-mileage runner. In fact, I pride myself on keeping my mileage pretty moderate. But, back in May, I was just so close...so I ran a couple of extra days and surpassed that century mark. Any guesses what happened as a result? Major heel pain! 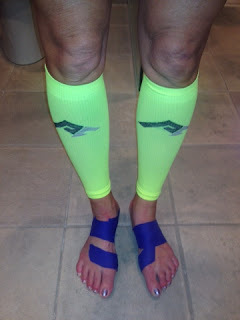 I never admitted to myself (or anyone else) that is was Plantar Fasciitis, but it certainly had all the makings of it. The pain was very localized, only on my right heel, and it didn't hurt much when I was running. But simply trying to stand or walk on it was most unpleasant. Ugh. I had a big (12 hour) ultra approaching (less than two months away) and a couple of half marathons (on back-to-back weekends) that I really did not want to miss. I trusted my endurance, so I scaled back my mileage (majorly) in the weeks following...and all went well. I was able to run both of my half marathons (though my finish times were nothing stellar), but my ultra went great. There also was a time when I dug out my old, but very favorite, Mizunos Wave Inspire 8's. Mind you, these shoes were almost three years old, and had gotten me through not only my first marathon (Quad Cities 2013),but also my second (IMT Des Moines 2014), as well as most of the training miles for both of those marathons. I did a quick run in them and was instantly transported back in time (ever so briefly) and reliving many happy miles in those comfortable shoes. I even wore them for a 5K the next day. 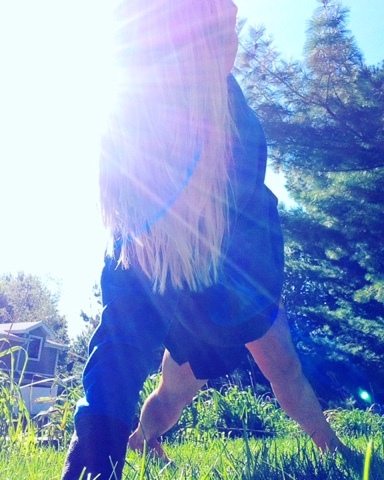 And in the days following, I experienced some hip pain and multiple other discomforts. Coincidence? I think not. In fact, I had a trail race a few days later (on a Saturday morning) and also a 15K (in the evening). Holy Yikes. I made it through the trail race alright (probably due to the soft terrain),but that evening was a different story. I ran the first 5K and could tell something was "off." 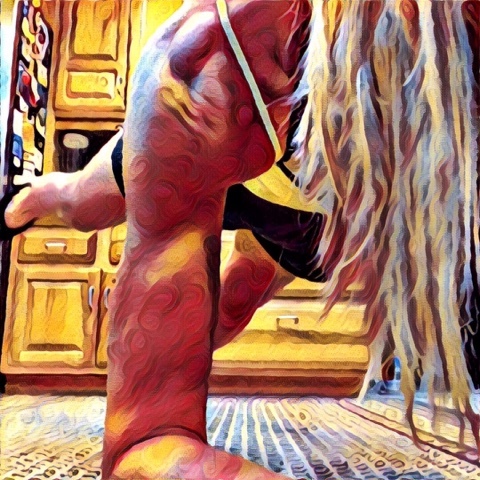 I couldn't pinpoint exactly what wasn't right, but I could not get my body to work and my hips and glutes and hamstrings were all on fire. I wound up pulling out of the 10K (my first-ever DNF) after the first mile. Sidelined. Humbled. And in pain. So, why am I sharing all of these unwise choices? Because although they were (temporary) low points, they also were teaching moments. Running continues to make me proud, but it also keeps me humble. I'm not afraid of sharing my mistakes with the world, I am only human after all. Mistakes are worthwhile if you gain some wisdom from them. What mistakes have you made with your running? Did you learn anything from them? Repeat offender? 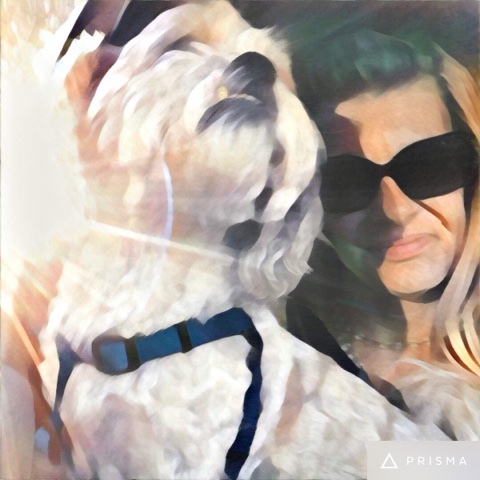 I'm linking up with Deb for the Wednesday Word...and toady's word happens to be Wisdom. And, also linking up with Suzlyfe Running on Happy Crazy Running Girl and Coach Debbie Runs for the Running Coaches Corner. Stick a fork in me, 'cuz I'm done. Not tired, but definitely "over-cooked." I hate to see (and feel) summer end, and apparently Momma N tried to appease me this week. That's right, summer came back with a vengeance...ironically, in the first week of fall. Monday was pleasant, though. 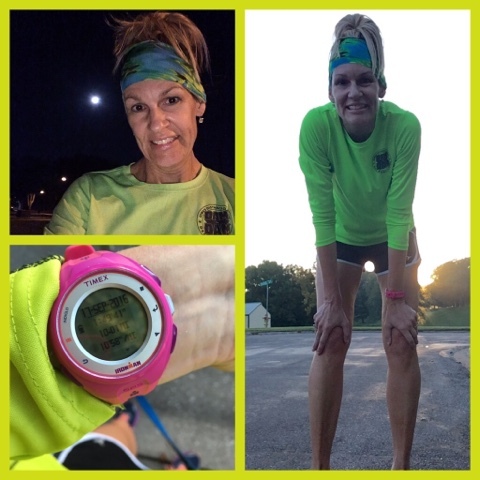 I headed outside for four easy miles (by the light of the moon) in the early morning. Never miss a Monday. Ever. Tuesday, I had some hill work on the agenda, and just did not feel like attempting those in the wee hours (and I may have been a bit sleepy when the alarm sounded at 4:58AM. I also had a busy day at work, so I didn't get home until near-dinner time and wanted to watch The Voice at 7:00PM. I changed clothes and headed outside, towards a nearby county road that has a couple of good hills. After running back and forth (several times), I finished the workout with almost five total miles (including warm-up and cool-down). And I was a saturated mess, but felt great for what I'd accomplished. Wednesday is typically a non-running day, so there's usually some strength work and moderate aerobic activity. And, of course, there's planking! Thursday arrived, and (again) I was not eager to do my assigned running in the early hours because I had timed ladders on the agenda, and those are a pain to do in the dark (for me) because I get annoyed by constantly needing to hit the "light" button on my watch. Instead, I waited to do those after work...in the heat of the day, none the less. I was a saturated mess after that workout as well, but felt great for the effort. Friday was another day of easy-does-it activity. Saturday. Ever have one of those moments of wonder when you read your training plan (again) and realize you had read it wrong several times prior? Well, I decided to double check a few details on the plan only to realize I had a short run on the roster. So, I got it done. An easy shakeout run is actually a good thing to consider if you have a race happening the next day. Sunday was race day! I have a deep fondness for the Quad Cities Marathon, being it was my first marathon (2013). This year, I was part of a relay team with three of my cousins and I also ran the half marathon. Momma N seriously played with our minds in the days leading up to the race....threatening rain and storms. Low and behold, she waved her magic wand and blessed us with a dry morning, ample sunshine, and lots of heat (and humidity). Alas, it still was a great time. Stay tuned, the recap is coming! And I also got in a plank after I finished the half marathon and had some down time (awaiting the relay team to finish). So there you have it. I think my weekly mileage came in around 29 (and some change), that's definitely my highest weekly mileage in awhile. Yikes, I'm currently sitting at 83 for September...so I'm gonna be close to another century mark for the month. Has it continued to stay hot in your area? What's the highest weekly mileage that you've done? 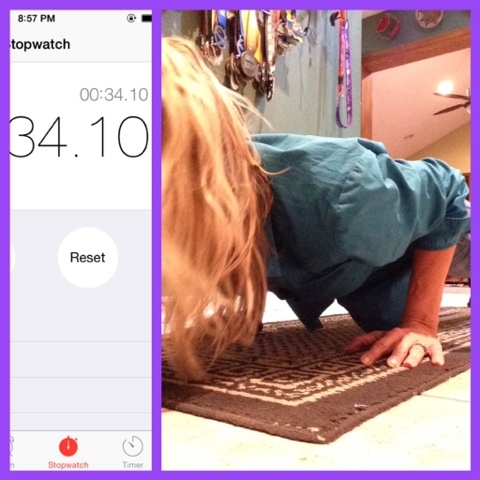 Did you plank this week? 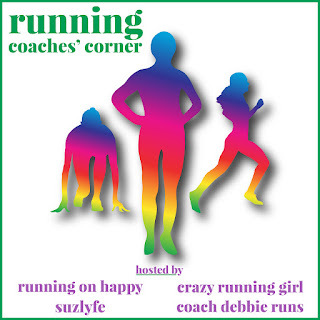 As usual, I'm linking with my gals Holly and Tricia for the Weekly Wrap. I encourage you to swing over and take a peek at their blogs and all the others linked. I have a very exciting weekend on the roster! I'm heading to the Quad Cities (a cluster of four adjoining cities along the Mississippi River) for the Quad Cities Marathon. This event will always hold a very dear place in my heart since it was the site of my first marathon (in 2013 ). 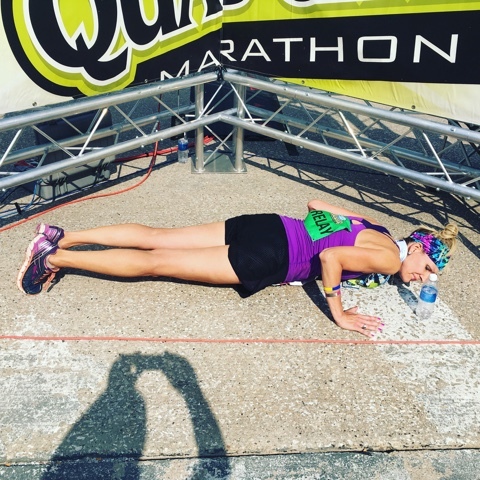 I returned and ran on a relay team last year (recap HERE ), and it was such a surreal experience being back at the start line...and then running in with the team to the finish line. I seriously had tears in my eyes and that awkward half giddy smile (because I was so excited to be there) and half awkward ugly cry face (again, because I was so excited to be there). This year, I'm not only running on another relay team, but I'm also running the half marathon. 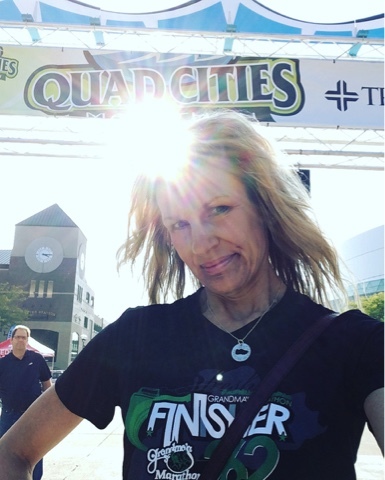 Oh, The Quad Cities Marathon! How I love thee! 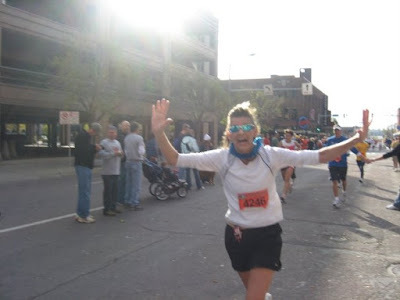 As mentioned, this was the scene of my first marathon (recap HERE). I was truly blessed with a perfect "first marathon" experience. 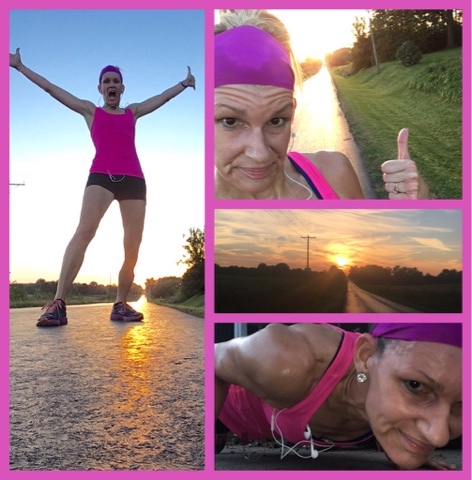 The weather was awesome, I managed my fuel like an expert, I never hit "the Wall," and even though I let myself walk a few times, I had no regrets. I even had a gentleman, Dean, run the final mile with me, all the while repeatedly shouting to the crowds of people,"Hey, this is Kim! It's her first marathon!" Yes, I felt like a celebrity. Then, as soon as we crossed the finish line, he grabbed a guy and immediately introduced us to each other...and told this guy that it was my first marathon. This guy was none other than Joe Moreno, the race director! Joe, then, congratulated me, and expressed his thanks to me for choosing the Quad Cities as my first marathon ((sigh)). It's a good thing I had just finished 26.2 miles and was slightly dehydrated, otherwise I would have been a blubbering mess. Seriously, how do you top that??? This will be a very significant race because all of us gals on the relay team are cousins. One of the gals, Jessica, is a seasoned marathoner (and a Quad Cities Marathon veteran as well). 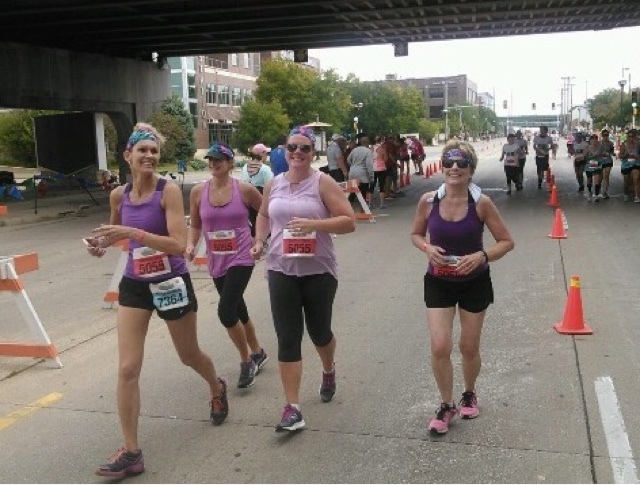 The other two gals, Rhonda and Kelly, have been running consistently in the past year or so but have not done many races (yet). This marathon will be their first time experiencing the 26.2 atmosphere. I am SO excited for all of them! On a side note, Jessica's mother (our aunt, Linda) is currently undergoing treatment for cancer. 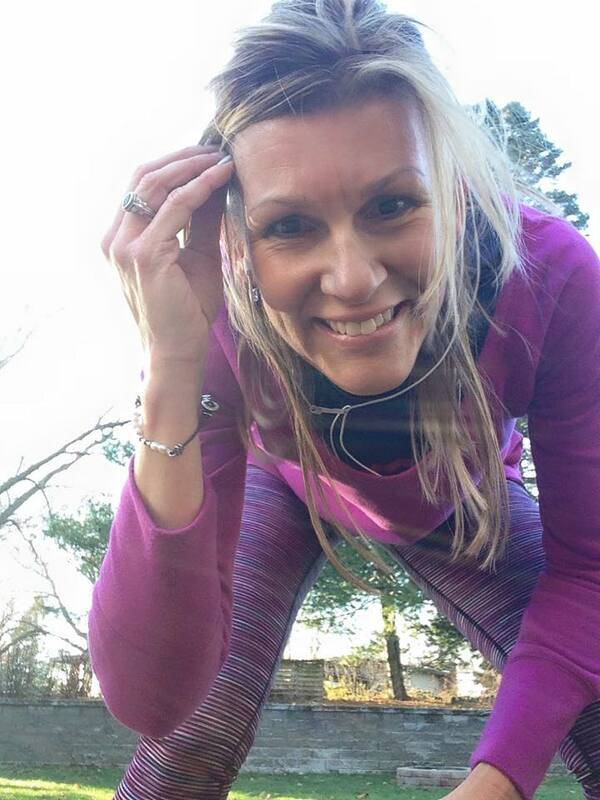 We are going to be lifting her up as we knock out those 26.2 miles and are dedicating this race to her. That's right...I'm bringing this theme along with me and sharing it with the team. We're all wearing purple, and I will be in search of some funky purple-patterned headbands at the expo. Life is all about living, right? A huge part of living is NOT blending in, so I am sharing my #colorfreak (that's a bonus #hashtag for you) with the other gals. Have I ever mentioned how much I LOVE the 13.1 distance? Well, this race will not only be run on a relay team, but I'm also continuing on after I hand off the baton and running the half marathon (the half marathon course splits off from the full course around mile 8.5). 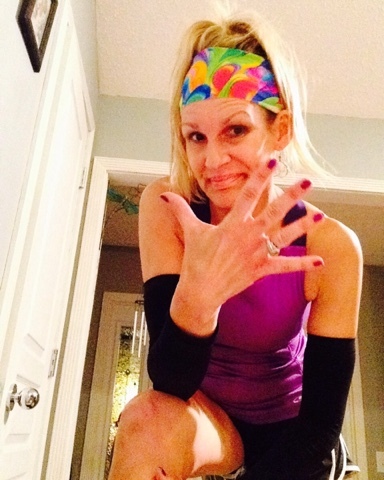 And, (cue the drum roll) this will be my 30th half marathon! So, yes, there's just a little bit of excitement in the air! So, do you think I have the makings of a great weekend? We're a little tense about the weather, though. 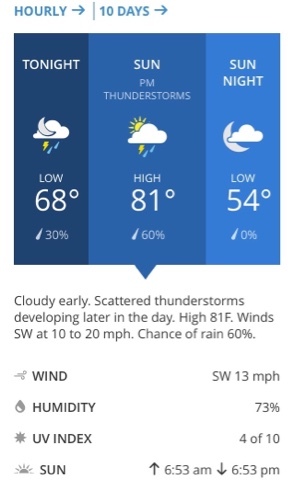 Currently, there is some rain in the forecast, as well as thunder storms...but most of that appears to be happening in the afternoon, hopefully long after we are all in our cars heading back to our respective homes. Have you ever run a marathon (or any race, for that matter), and gone back and done other events in subsequent years? 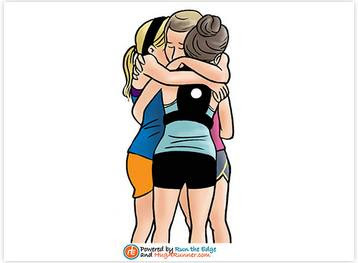 Ever been on a relay team? 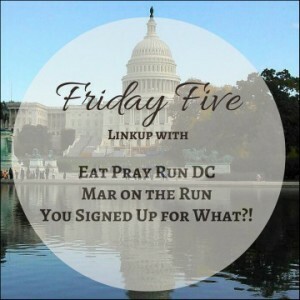 I'm linking up with the DC gals (Mar and Courtney and Cynthia )for the Friday Five....I encourage you to check out their blogs, as well as the many other linked blogs for some great reading! Another crazy week is in the books (with some Aha Moments ). Whew! Stick a fork in me, because my rest/recovery days were greeted with open arms! This week's theme? I can do hard things. 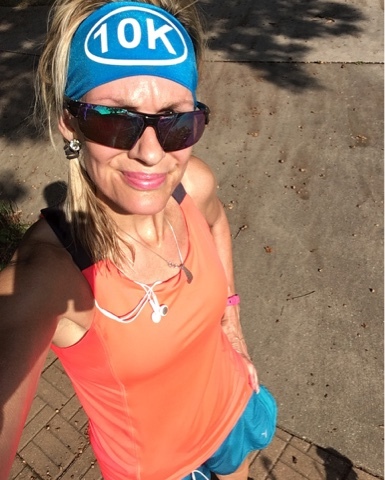 My first outing in the running shoes, on Monday, was greeted with nice, crisp temps and and clear skies. 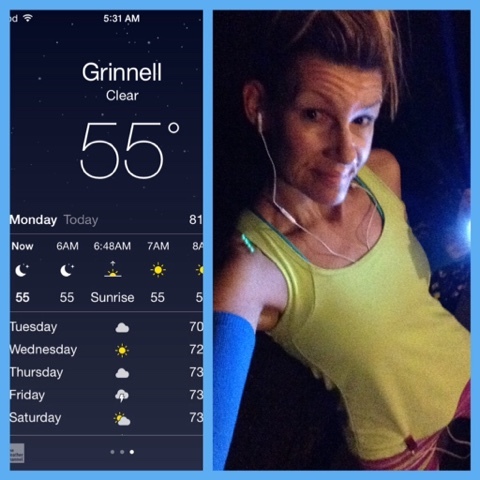 I hammered out four easy miles and was back home before the sunrise. As I have said before, I welcome the cooler temps, but it's with a sad heart that I bid farewell to summer. Tuesday, I woke up early,but just was not feeling the run. 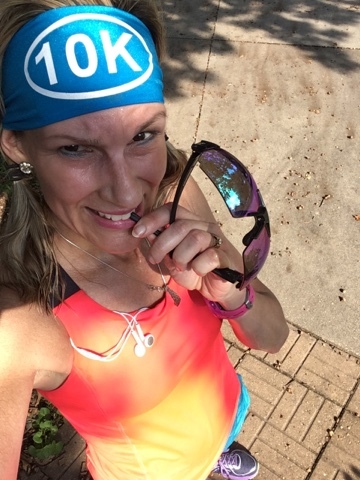 My body was feeling fatigued (too many late nights prior to my early mornings...#myverybad), and I rationalized I could just do my run after work. The temps were also pleasant, and there was ample cloud cover, so the heat would not be much of an issue. All worked out well, and I was able to get my run done in the mid-afternoon hours. I was supposed to do a negative-split run...but my mojo kicked in, and the run turned into more of a progression run instead (which still netted me some awesome negative splits). 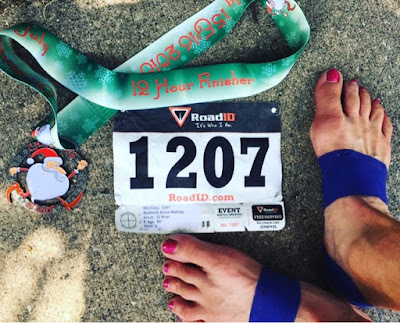 My splits (after the 1-mile warm up) were 10:29, 10:11, 10:06, 9:48, and 9:33), and that's just what my shattered ego needed as a comeback performance following my frustrating half marathon (recap HERE ) three days prior. Wednesday is typically an active recovery day. We also had an unplanned jaunt to Iowa City (an hour away) to tend to some landlord duties (dead oven in our rental). So, there were some (oven) dead lifts and squats added to my roster. When we returned back to town around 9:30 PM, I was exhausted, but had not had time to do any light cross-training....so I went with my fallback go-to: stair-climbing. I added in some planks and push-ups, and nearly collapsed in the stairway before falling into bed. It was hard, but I got it done (and slept pretty soundly). Have you ever done hill repeats on a treadmill? Holy crap. There are no words to accurately describe the torture of that workout. After an easy warm-up mile (outside, in the beautiful mid-day sunshine), I headed back inside and fired up the 'mill. I set the incline on 4, and upped the speed to 7.0 (ha ha ha, a bit grandiose, don't you think?). After 600 meters, it was all I could do to not fall off as I hit STOP. 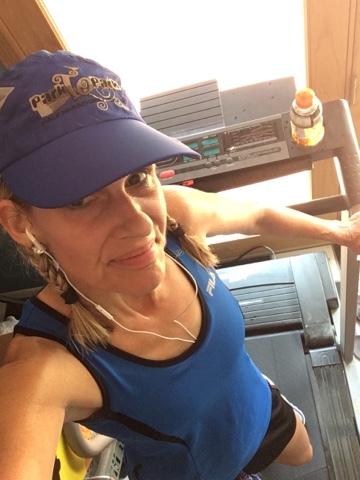 I lowered the incline, and reset the speed for 4.5 for an "easy" recovery jog. I then, again, adjusted the incline to 4 and upped the speed to 6.8 (because 7 was just too crazy for me). After 600 meters, I (again) had to hit STOP for fear of face -planting as I lowered the incline back down and reduced the speed. This pattern continued for four more sets. Although I was tempted to call it quits after four, I persisted and finished all six. My legs felt like over-cooked spaghetti, and there were drops of "water" everywhere on the control panel (remember, this had not been in use for several months, so it was pretty dusty when I started). My braids were dripping and my clothes were totally saturated...but I had (somewhat) conquered the beast. Even though I eventually lowered the incline to 3 and reduced the "fast" speed with each set, I felt like a war hero returning from combat when I climbed (carefully) off the 'mill and headed to the shower. Wow, that workout was hard. Friday was pretty uneventful after Thursday's hill repeat episode. Some simple cross-training, foam-rolling, and fueling for Saturday's long run. With a busy morning on the agenda (volunteering for a local race), I headed out early to get my 10 miles done. 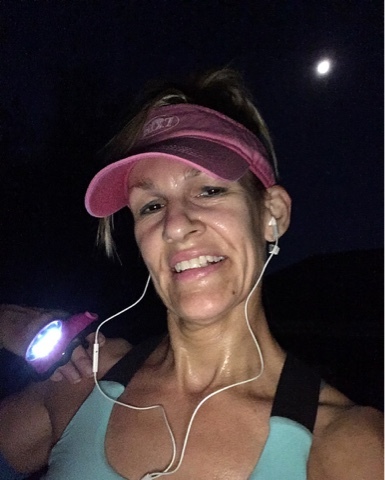 I left the house around 5:20AM and got almost three miles done (under the beautiful full moon) before meeting up with my friend, Barb. The two of us ran almost six miles together. We parted ways (she also was helping with the race and needed to report for duty earlier than me), and I finished up the final miles on my own. I really like these early morning miles. The tranquility and peacefulness is beautiful, and it feels great to get the miles done before all the other craziness of the day begins. Sunday was another low-key, active rest/recovery day. There was some planking, biking, and LOTS of stretching and foam-rolling. In other news, the planking challenge is going strong! It's hard to believe we're already past the halfway mark. I don't always post my planks daily, but I have been doing them. I'm currently around 80 total planking minutes for September. 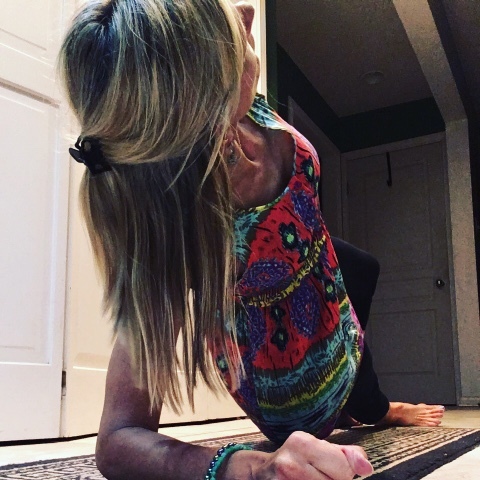 There may be a few more minutes that I have forgotten to write down...my goal is not a specific number, but to keep on with the daily planking and inspire others to do the same. Are you planking with us? Want to join us? Use the hashtags on Facebook and Instagram #GoAhead #MakeMyPlank! How was your week? Great workouts? Plenty of action? Can you do hard things? As usual, I'm linking up with the lovely Holly and Tricia for the Weekly Wrap. Do headover and see what's been happening! Recent things that made me go "Hmmmmm"
How did August play out?